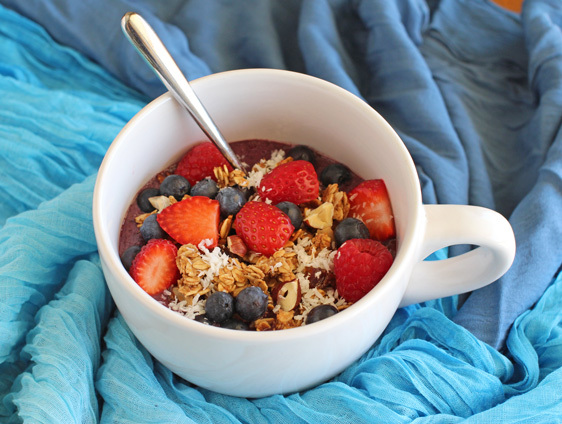 An açai bowl is a thick smoothie of açai fruit blended with juice and other berries, topped with granola, fresh fruit, shredded coconut and a liquid sweetener. Although originally a Brazilian treat, I was first introduced to this sweet, delicious meal while on a trip to San Diego, where it’s popular in the beach-side cafés. Açai bowls are also easy to find in Hawaii, I later found out. But here on the non-coastal mainland, many people have never heard of them, so I thought I would share my recipe with you. An açai bowl is one of my favorite breakfasts any time of year, but topping it off with *fresh* berries is an extra treat, so berry season seemed like the perfect time to spread the word. Açai (pronounced ah-sigh-EE) berries grow in large bunches atop tall açai palm trees in the rain forests of Central and South America. The dark purple fruit looks like a grape-sized blueberry, and it is full of immune boosting, disease fighting antioxidants. The fruit is highly perishable and must be frozen within 24 hours of harvest. Frozen açai smoothie packs and refrigerated juices are available in supermarkets, but I am skeptical about the açai content of such products in proportion to the other less expensive and arguably less beneficial fruits with which it is often blended. They make me wonder if I’d be paying açai prices for mostly other berries. 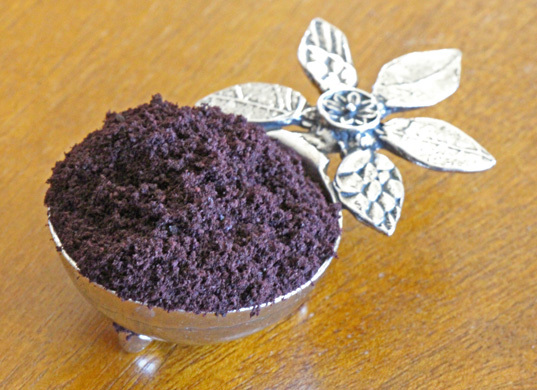 The product I buy is pure organic freeze-dried açai berry powder from Mountain Rose Herbs. It’s a bit expensive, but it’s a valuable food. This way I know exactly how much good stuff I’m getting. For more information on açai, see the health information below. In this particular recipe, the addition of hemp and chia seeds gives this meal a huge protein boost and even more superfood antioxidants, although these ingredients are not traditionally used in açai bowls. 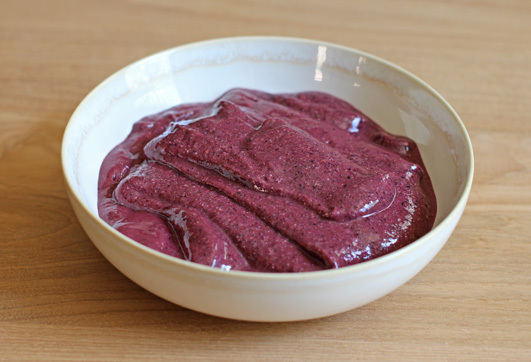 This recipe makes two açai bowls. Fresh blueberries, raspberries, sliced strawberries, sliced banana, etc. Your choice of chopped nuts, raisins, dates or other dried fruits, etc. Blend together the apple juice, frozen berries and banana, hemp and chia seeds, and the açai berry powder in a high-speed blender, until it forms a thick smoothie. It’s more fun to eat if it’s thick enough to scoop with a spoon, rather than being a drinkable liquid consistency, so don’t over-blend. If it does melt more in the blender than you like, add a half cup of crushed ice and blend briefly again. Transfer the smoothie to two bowls and top with granola. 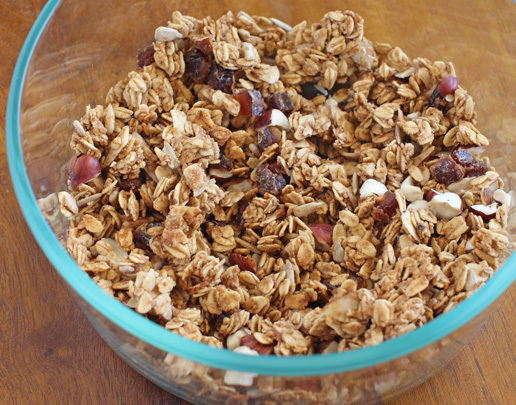 Granola is so easy to make yourself and it tastes fantastic when it’s homemade. There are hundreds of recipes out there. Have you tried my recipe for Crunchy Almond Pecan Granola yet? Finally, put the finishing touches on your breakfast with fresh berries and other fruits, chopped nuts and dried fruits (whatever sounds good to you), shredded coconut and agave syrup. Açai berries have one of the world’s highest ORAC (Oxygen Radical Absorbance Capacity) values. ORAC values are a way to measure how well antioxidants can neutralize free radicals, which are molecules that damage tissue and accelerate physical aging. Free radical damage can also lead to cancer, so the more antioxidants you get, the better. Açai is also rich in anthocyanins (its deep color is a dead giveaway), and there is increasing evidence that anthocyanins possess analgesic, neuroprotective and anti-inﬂammatory properties. The fruit is also rich in protein, fiber, omega-3, -6 and -9 fatty acids and Vitamin C.
Blueberries are a good source of Vitamin C and K, but their high phytonutrient and antioxidant content is what gives them their “superfood” status. Just like in açai berries, the nutrients contained in blueberries are known to reduce the effects of oxidative stress on the whole body (anti-cancer, anti-inflammatory, cardiovascular and circulatory support, muscle repair, and reportedly even memory boosting benefits). Hemp seed is 65% protein by weight, making it one of the best plant sources of protein available, and it’s especially good because that protein comes in the form of globulin edestin, which is easily digested. It also contains the essential fatty acids (EFAs) in a ratio that is suitable for human nutritional needs. It is a good source of fiber, as well as magnesium, iron and zinc. It’s also gluten-free, and there are no known allergies to hemp seeds. Chia seed was highly prized by the ancient Mayans and Aztecs, and for good reason. It is a source of protein, fiber, omega-3, -6 and -9, antioxidants, calcium, iron and magnesium. Chia seed has been found to lower high blood pressure when taken daily, and can help keep the blood sugar at a more even level over time because it slows the way complex carbohydrates are digested and assimilated. Chia also helps the body maintain a healthy level of hydration, which makes it particularly helpful for athletes. If you used a homemade, low-sugar granola to top your açai bowl, then it probably offered additional nutritional value if it contained some rolled oats and nuts. Oats are high in protein as well as fiber and thus offer many health benefits that include lowering cholesterol and high blood pressure, evening blood sugar levels and promoting healthy bowel function, and nuts contain protein and healthy fats, which are essential for a healthy metabolism. 3 Responses to "Açai Bowl"
David and I LOVE açai bowls! There’s a smoothie place/cafe across the street from us that makes them. Sometimes we share one as a weekend breakfast treat! Can’t wait to use your recipe to make our own. We already buy little frozen packages of açai for our smoothies. Thanks for the recipe! That looks absolutely delicious! 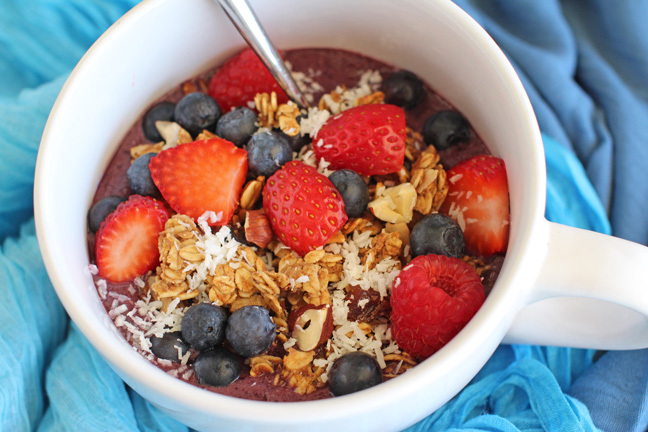 I’m going to make and try the acai bowl soon!